The Boston Red Sox and the New York Yankees have baseball’s most famous rivalry. And after the latest brawl between the two teams brought the Red Sox vs. the Yankees front and center again, the Red Sox Triple-A affiliate is getting in on the action and spinning the renewed rivalry into an entire weekend of anti-Yankees fun. The Pawtucket Red Sox — known as the PawSox — announced “Evil Empire Weekend” on Thursday, which will be on May 5 and 6 to celebrate “Star Wars.” And if a Red Sox affiliate is hosting an “Evil Empire Weekend,” you know who the evil empire will be: the Yankees. And it’s the perfect weekend for it, since the PawSox are hosting the Scranton/Wilkes-Barre RailRiders, the Triple-A affiliate of the Yankees. But the PawSox are taking it just a little bit farther for this promotion. The team is taking its cue from the big league brawl and banning anyone with the name Tyler or Austin from attending, and allowing anyone with the names Joe or Kelly to get in for free. 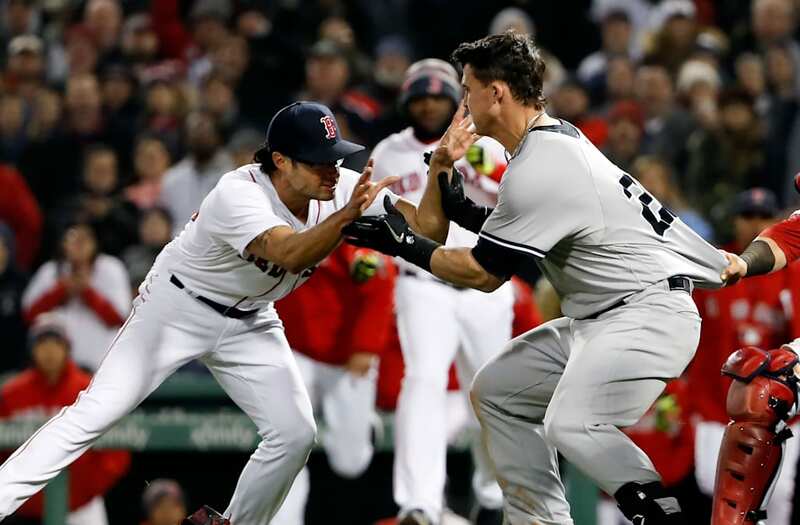 Tyler Austin of the Yankees started the recent bad blood between the teams when he spiked Boston’s Brock Holt on an aggressive slide. That was followed by Joe Kelly throwing at Austin, Austin charging the mound, and the benches clearing. The name-banning portion of this promotion is brilliant, but it doesn’t stop with banning Tylers and Austins from the park. According to the PawSox website, admitting to having other Yankees names will lead to other penalties. In addition, fans who confess to being named Aaron, Gary, Aroldis, Didi, CC, Jacoby, Masahiro, Giancarlo (or Mike) will be charged double the price of a regular ticket. All Yankee fans will, of course, be warmly welcomed. Highlights from the Red Sox’s historic 2004 ALCS comeback vs. the Yankees will also be shown on the video board throughout the weekend, along with other dramatic Boston conquests from history (of which there are many). The PawSox have really thought of everything. The RailRiders host the PawSox just a few days before “Evil Empire Weekend,” and it doesn’t appear that the team has anything planned. But after seeing what the PawSox are doing, the RailRiders might want to consider planning a playful anti-Red Sox weekend of its own.